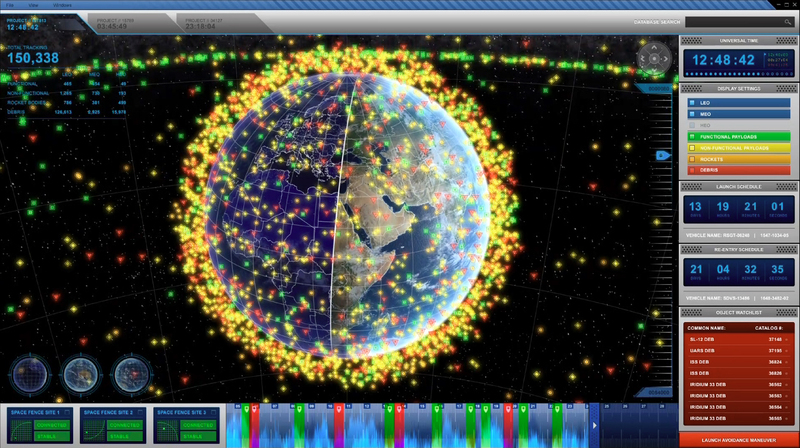 Space Fence program tracks debris (Credits: Lockheed Martin). As of March 8, a prototype of a new radar system, part of the U.S. Air Force’s Space Fence initiative, is operational. The protoype was developed by Lockheed Martin and is responsible for detection and tracking of resident space objects. The protoype uses solid state S band radar, using a higher frequency than the Air Force’s current system, enabling detection of smaller objects. Ground based radar is the best technology available for monitoring low Earth orbit debris, but becomes increasingly less effective at higher altitudes, such as the crowded geosynchronous orbit. Space Fence is intended to replace the current U.S. Air Force Space Surveillance System (AFSSS), an ageing system first installed in 1961. The Air Force has indicated that a production contract for Space Fence will be awarded in 2012 with the system becoming operational in 2017. Lockheed Martin received approval of their preliminary design on February 29.